Put your company logo on our wide selection of plastic ball markers for your next golf tournament, event, outing or promotion. 4. Your plastic golf ball markers will be produced and shipped followed by a tracking number sent by email. Poker Chip Logo Golf Ball Marker. 11.5 gram 8-Stripe Custom Poker Chips with Full Color Printed Laminated Decals on both sides. Decals are printed on high quality vinyl and then laminated for the ultimate durability and protection against spills.&nbs.. Custom Logo Quarter-Size Plastic Golf Ball Markers. 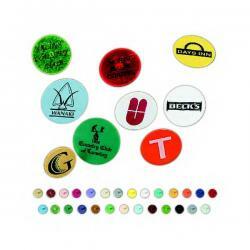 Custom printed quarter size plastic ball marker with a 1 color custom imprint of your logo or text and come in 27 different colors. Great inexpensive promotion or display for golf outing advertisement, o.. Custom Logo Promotional Plastic Golf Ball Markers printed dime size plastic ball marker with a 1 color custom imprint of your logo or text. Rush service available, Made in USA. ..